Earlier today I came across an undergrad worrying about finding part-time work. This person is certainly on the right track; he’s looking for a job he can continue after graduation. He’s developing skills that will lead to a satisfying career, if he so chooses. But he’s wrong in one major way. Other than a few small inconveniences (which I’ll describe in a moment), it doesn’t matter if you attend school in a small town or in New York City. What matters is if you’re willing to do what other English Majors in your town aren’t. Are you willing to sacrifice some free time (*coughNetflixcough*) to learn skills? Are you willing to take the scary step of putting yourself out there, facing possible rejection from potential employers? Are you willing to cold-call businesses to see if they have work for you? Are you willing to turn down bad offers and hold out for a better alternative? It’s scary. But success comes to those who are brave enough to do what others shy away from. Living in the twenty-first century means we are no longer limited by geography for employment. I live in the Bay Area, and none of my clients are anywhere near where I live. I mostly work with people on the East Coast, a guy in Reno, one in Atlanta, etc. Sure, I have some early mornings when clients want to make 10am Eastern phone calls (that’s 7am on the West Coast). But the fact none of my clients live near me is proof even those attending school in small towns can find meaningful work. Having attended school in a small town (for both my BA and MS degrees), I understand how it may seem like there aren’t a lot of job opportunities. However, being in big cities is actually more of a challenge sometimes. Bigger cities = more people = more people with degrees competing for your job (and willing to take the same low pay). In small towns, it’s easier to stand out and impress potential employers. Many small business owners will be thrilled if you can show them a way to improve their businesses through writing better website copy, customer newsletters, or advertisements. Plus, if you attend school in a small town, your monthly expenses will probably be low. This means you won’t have to pay as much for a decent apartment and groceries, making the possibility of choosing productive part-time work a reality. Of course, there are a few downsides of being in a small town that you’ll need to overcome. Despite these challenges, it’s possible to create opportunities for a part-time income. Better yet, it’ll be a part-time income where you’re doing satisfying work and learning valuable skills. If all this sounds too hard for you, don’t panic! 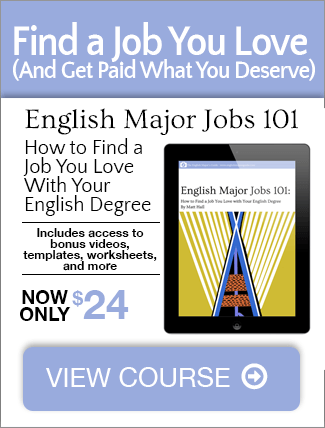 I’ll give a step-by-step plan anyone can follow to find great part-time student employment opportunities in The English Major’s Guide to Finding a Job. PS: I promised to share something special in this message. Well, here it is: a guide to learning how to get paid to write content online. I reviewed lots of guide on how to get started, and this is the one that I felt was the best (well, until I publish my own). In fact, I took a similar path to this writer and now enjoy similar success. Here’s the link:Ramsay’s “The Penultimate Guide to Making Money with Paid Content Writing.” With what Ramsay covers in his guide, you can get started writing online (and making $25-$30/hour, as I did when starting off) in about a week. Thanks so much for sharing my guide! There really are so many opportunities online for someone who can communicate well. I really recommend making your own blog as a base (like this one!) as it will build up your reputation and proof as your career progresses.